It is 2018 in Toronto, one of the world’s most multicultural cities, and we are watching The King and I, an American musical about an Englishwoman in Siam (now Thailand), onstage at the Princess of Wales Theatre. For a Mirvish-presented blockbuster-musical, that’s a lot of cultural lenses to gaze through. However, it actually does the show a favour by enriching its themes of overcoming prejudice, friendship and unity — ideals which matter now more than ever. Given its dated setting and infamously Orientalist overtones, a show like this isn’t one you stage without being prepared to address some of the depictions of race embedded into the story. With some ambitious design and subtle performance choices, this iteration of the show makes a genuine and conscientious effort. Micheal Yeargan’s set is vivid and visually stimulating, using a straightforward yet elegant design to illustrate the scale and majesty of the Siamese court. The space is healthily occupied by the dancers and company members, performing fluid and grand choreography by Christopher Gattelli that establishes aesthetic just as much as the physical surroundings. The scene feels authentic, rather than being a touristy, “exotic” mish-mash of Eastern accouterments. That said, the show is not a perfect unpacking of racial stereotypes from yesteryear. It’s a big ask for a musical from the 1950’s depicting events in the 1860’s to be “woke.” Anna’s headbutting with the King, considered feminist when this show first debuted, now seems tone deaf. We see Siam through her eyes, but to audiences today, her culture shock works best when played for comedy. It’s apparent that she’s much more flummoxed by this “other” culture than they are of her. Elena Shaddow’s Anna conveys her flustered and earnest nature with much charisma, which keeps the “east meets west” trope from feeling too overplayed. The production I saw had understudy Darren Lee taking on the role of King Mongkut for the evening, who provided a layered take on the royal deuteragonist. His persona undergoes a subtle shift between scenes in private versus those when he holds court as king. Rather than a booming patriarch, we see a man struggling under the pressures of leadership, trying to do right by his family and subjects. He is also wise to the games of Europeans — a sentiment echoed through his palace, as Joan Almedilla’s Lady Thiang performs “Western People Funny” with an undeniable, delightful sarcasm. Speaking of which, the women in this performance emerge as the ones to watch. The aforementioned Shaddow and Almedilla shine with a rich and dynamic rapport. They’re rounded out by the soulful and stunning Tuptim, played by Q Lim. Despite the title of the musical being what it is, I found the relationships between these women to be the most compelling to watch develop. Each was a complex individual with wants and needs. Though carefully-directed, this version of the musical feels bittersweet to an audience that still endures the after-effects of British colonialism. It’s not unproblematic — but therein lies a learning moment. To act like these prejudices didn’t exist then or persist now would be dangerous. Just because it’s a spectacle show doesn’t mean you can’t put on your thinking cap. My hope is that given the large number of immensely talented performers of Asian heritage onstage, they’re able to use their voices to shape the future of live theatre so that when stories like The King and I are told, we can appreciate them as products of history. This show is entirely worthy of being called a spectacle, but make no mistake, they are watching us watching them. Audience Advisory: Use of strobe and haze. Recommended for ages 8 and up. 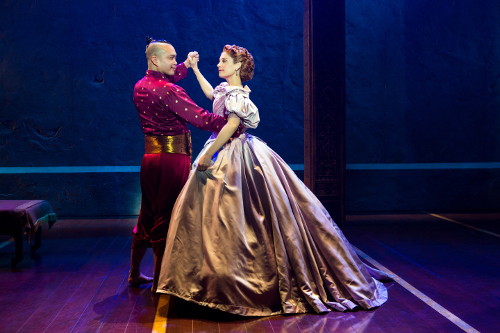 Photo of Jose Llana and Elena Shaddow in Rodgers & Hammerstein’s The King and I. Photo by Jeremy Daniel.